← How to convert files of AutoCAD to gif? What is DCX file format? DCX is an uncommon file extension. Maybe you have never heard of it. It is the extension for several file formats including a Fax Serve Fax document, Microsoft FoxPro database index, and a bitmaps graphic file. It is similar to many other common image files like a TIFF or JPG.DCX is a fax format used by ACCPAC FAXserve, a program that can send, receive, and broadcast faxes from a computer; saves images and text in a digital format that is viewable by multiple fax programs. How to convert AutoCAD to dcx? How to convert files of AutoCAD to dcx is a problem if there is no relevant converting software in your computer. You may need a document converter which supports this function. docPrint Document Converter Professional will be a good choice. docPrint Document Converter Professional which is also called docPrint Pro is a software product that dynamically converts MS Office 97/2000/XP/2003/2007, WordPerfect, AutoCAD DWG, PostScript, Adobe Acrobat PDF and many other document types to Adobe Acrobat PDF, PostScript, EPS, XPS, PCL, JPEG, TIFF, PNG, PCX, EMF, WMF, GIF, TGA, PIC, PCD and BMP etc formats. It works in both GUI version and Command Line version. With docPrint Document Converter Professional you can convert your documents from and to 50+ formats easily. The download website of docPrint Pro is http://www.verypdf.com/artprint/docprint_pro_setup.exe. You will find there are three parts in docPrint Pro after you install it in your computer.They are GUI application, command line application and virtual printer(docPrint and docPrint PDF driver).The three applications can realize the same function by different operations. 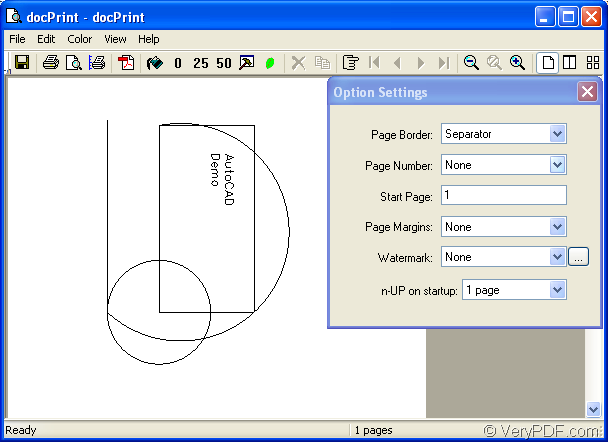 In this article, you will know how to convert AutoCAD to dcx with docPrint. Setting docPrint as your default printer is recommended because you don’t need to waste a lot of time and many useless operations. The following contents are the steps of the conversion. 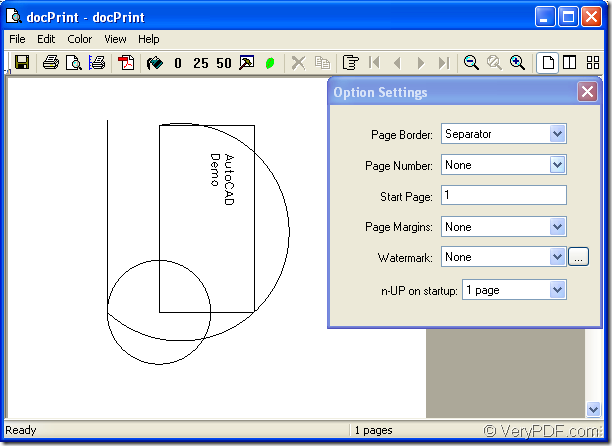 If docPrint is default printer in your computer, you can run your printer driver by right clicking the dwg file and clicking “Print” option, which is the easiest way. If not, you should open the dwg file first, then click “File” and click “Plot” in the dropdown list. You will see there is a new dialog box pop up and please choose “docPrint” as the current printer in “Name” combo box, then click “OK” button. Or you can use the hot key “Ctrl”+ “P” to realize the same function. The “docPrint” dialog box appears next will lead you to open “Save As” dialog box.Please see Figure1. 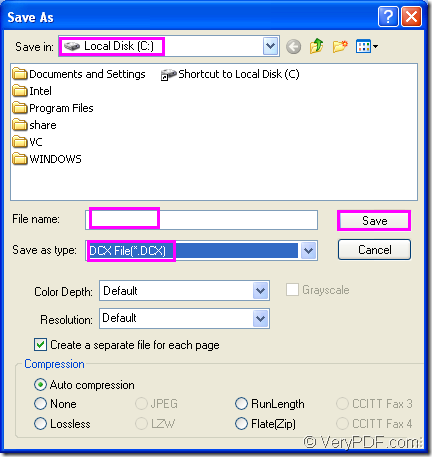 In the dialog you can do the following operations to open “Save As” dialog box. You can click “File” and click “Save as” in dropdown list, which is a regular way. You can also click the icon to open “Save As” dialog box. The hot key “Ctrl”+ “S” is surely a popular way taken by many computer users.Then you will see the dialog in Figure2, which is the last one you should operate in. In “Save in” combo box, you should specify the directory of the target file, no matter the existed one or a new created one. In “File name” edit box, you should input the new name of the target file. 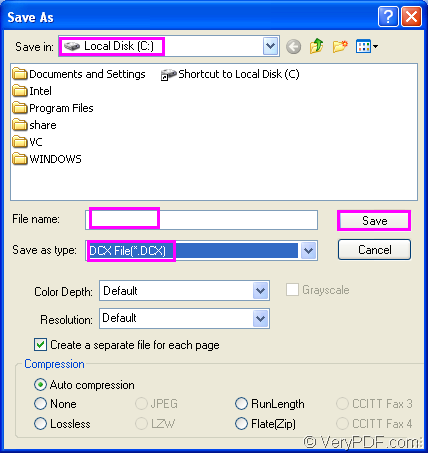 In “Save as type” combo box, you should choose the file type of the target file, of course, here you should click “DCX File(*.DCX)”. To click “Save” button is to start the conversion and you need to wait for no more than 10 seconds. In “Save As” dialog box, you don’t need to care about other settings if you want to convert AutoCAD to dcx only. You can browse the target file with some programs such as Photoshop, IrfanView, GSview,etc. until the conversion is over. If there are still some questions about docPrint Pro, you can visit http://www.verypdf.com/artprint/index.html to see its introduction. How to convert a web page to tif?